When Bill Gates first introduced Microsoft Office on the COMDEX computer dealers expo stage in 1988, nobody expected the significant impact the office suite would have on the application of PC software. Flash forward to 2015, and with 25 years of Microsoft Office under their belt, it’s safe to say that Office is the leading all-in-one office suite software. If you’re curious to know, What Makes Microsoft Office so Big? 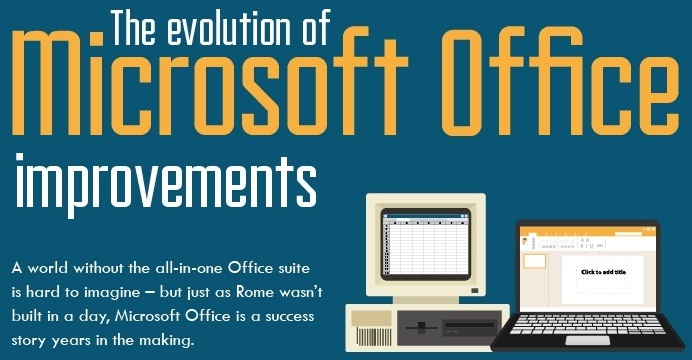 then you must check out, Infographic of Microsoft Office Brief History with Success Story, and its evolution and revolution in last 25 Years with it's old software versions to newly available version. In November 1990, the first version of Office was released to the general public under the obvious title of Office 1.0 by Microsoft. Here it introduced the likes of Word, Excel and PowerPoint as a whole new way of working via the PC. As popularity grew for the office suite, so did the demands. Over the next couple of years Office 1.5 and Office 1.6 introduced additional improvements to their software and added Mail to their growing roster of applications. Office 3.0 helped to start a new direction for the software bundle as it was later renamed as Microsoft Office 92 as a way of testing – a tradition which started from Office 1995 continued thereafter with the software today. It was not until June 1994 that there would be a new piece of software added to the suite and it was delivered in the form of Access – the database management system. Office 1995 brought along the short-lived Bookshelf and Exchange Server which was to replace the Mail application. Office 1997 was the first version of the application to cause a real stir within PC users as it also coincided with the major boost of popularity of the internet. This version also replaced the previously added Exchange Server with Outlook alongside Publisher – two major applications still in operation today. 1997’s version also introduced Office Assistant and more importantly, clippie the paperclip. The latest and current version, Microsoft Office 2016, has focused on vast improvements to their security and has become the first version to be fully optimised for use on touchscreen and mobile devices and has had a massive focus on integrating cloud-based features to all of their applications. Ever since its launch, Microsoft Office has only got bigger and better. The revenue for Microsoft has gone from single digits in the 90s to an estimated worth of around $95 billion this year showing just how much interest there is in Office and how many users rely on using the software. Below Infographic has been provided by MicrosoftTraining.